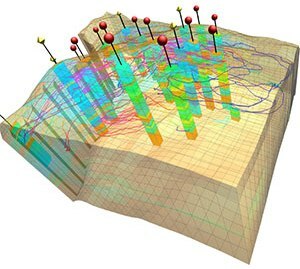 BELLEVUE, WA, Dec 8, 2016 – Tecplot, Inc., developer of the leading visualization and analysis software for reservoir engineers, announced the general availability of Tecplot RS 2016 Release 2. Engineers who use the Nexus (VIP) reservoir simulator have a new quick load option. The quick VDB loading option makes it possible to skip certain types of data during the process of loading XY data. This should speed up data loading times across networks. Additional New Features & FixesMacro and scripting capabilities give users the ability to perform repetitive operations in one click. As macros get more and more complex, the risk of error in writing them increases. The new macro debugger in Tecplot RS steps through users’ scripts and helps them in quickly identifying issues. Other new features include the ability to read nearest neighbor connections (NNCs) from Eclipse .init files, and the support by generic ASCII data files for network connections, connection lists, and nodes. Tecplot RS users with current Software Maintenance Service can upgrade to Tecplot RS 2016 Release 2 at no additional cost. Update Your Software. Special pricing is available for Academic users upon request. Tecplot for Academics. CSI is a public company listed on the Toronto Stock Exchange that acquires, manages and builds software businesses that provide mission-critical solutions in specific vertical markets. Since its founding in 1981, Tecplot has consistently delivered category-leading innovation to the engineering and scientific communities. Examples of this never-ending innovation include Tecplot 360 EX for lightning-fast analysis of CFD simulation and test data, Tecplot RS for oil & gas reservoir simulation and Tecplot Chorus for exploring large data sets composed of multiple solutions or experiments. For more information, visit www.tecplot.com/rs. This entry was posted in CAD-CAM-CAE, Featured News on December 8, 2016 by Sharmila Guha.